For all of you that are California dreamin', tickets for the four events that make up the Norcal Nights series are now all on sale. Saturday, June 17 Set atop the East Bay Hills in the Cal State Hayward stadium, spectacular views of the Bay Area and West Coast corps await fans attending this event. Presented by Santa Clara Vanguard. Find more information and order your tickets. Sunday, June 18 Held at Johansen High School in Modesto, the Kaleidoscope Klassic is the perfect Father's Day outing. Presented by Fever. Find more information and order your tickets. Friday, June 30 A time-honored, venerable California event, Precision West takes place this year at Diablo Valley College with picturesque Mt. Diablo set in the distance. Presented by Blue Devils. Find more information and order your tickets. 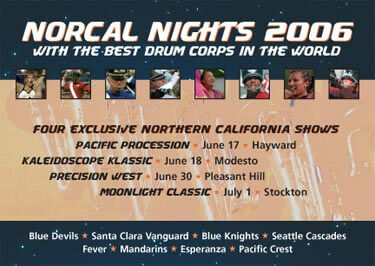 Saturday, July 1 University of the Pacific's Stagg Memorial Stadium offers excellent vantage points and sound quality for all drum corps fans attnending the Moonlight Classic. Presented by Sponsors of Musical Enrichment (S.O.M.E.). Find more information and order your tickets.